Versatec Variable Speed Series water source and geothermal heat pump line achieves 34.0 - 41.0 EER and 4.4 - 4.9 COP with a capacity range of 25 percent to 100 percent. Available in 3- to 6-ton capacities, in both horizontal and vertical configurations. Aurora advanced controls offer true energy, refrigeration and optional performance monitoring, while the optional Aurora UPC DDC package uses BACnet, N2 or LON protocols to integrate into building automation systems. 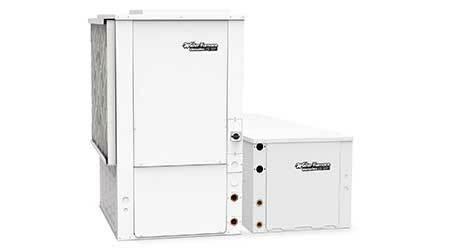 The heat pump line features Copeland Gen2 variable speed scroll compressors and inverter drives. The compressor’s brushless permanent magnet motor, along with variable volume ratio and high volumetric efficiency valves, provide outstanding performance and reliability.The units also include all-aluminum air coils that help ensure durability and efficiency. An optional AlumiSeal coating offers added protection. Additional features include optional modulating reheat that modulates via compressor speed to deliver true low-humidity neutral air. An electronic expansion valve with superheat envelope control provides optimal refrigerant flow in the variable capacity system to ensure high efficiency and compressor reliability. Integrated EC direct drive fan motors with an oversized forward curve blower on select models provide high efficiency and constant CFM quietly, no matter the external static pressure. The line also features cabinets constructed of heavy-gauge, environmentally responsible galvanized steel for maximum corrosion resistance. Units are available with a white powder coat finish or unpainted. All interior surfaces are lined with ½-inch-thick, foil-lined acoustic-type fiber insulation, applied in a manner that prevents the introduction of glass fibers into the airstream.